The City of Calgary is undertaking a Functional Planning Study for the Sarcee Trail/Richmond Road S.W. interchange. As part of this, The City sought input on potential designs and your priorities for the interchange. The City of Calgary is undertaking a study for the Sarcee Trail/Richmond Road S.W. interchange. Although there is currently no funding allocated to construct an interchange at this location, The City hopes to have these plans approved and have the interchange included as a candidate project for funding in 2018. This timing allows us to evaluate the option to design and construct the interchange in coordination with the Southwest Calgary Ring Road (SWCRR), which is scheduled to open by 2021. Due to the growth of Calgary’s southwest and the opening of the SWCRR in 2021, The City conducted a Southwest and West Ring Road Downstream Traffic Impact Study in 2015. The results of this study indicated an interchange at Sarcee Trail and Richmond Road would provide significant benefits to the overall road network, as well as the surrounding communities, regardless of whether or not the West Calgary Ring Road (WCRR) was in place. The objective of this study is to determine an interchange configuration that fits with the SWCRR and the local road network, provides accesses to local businesses and connects appropriately with communities. The public engagement for this study is now complete. For additional information and updates, please see the project page. 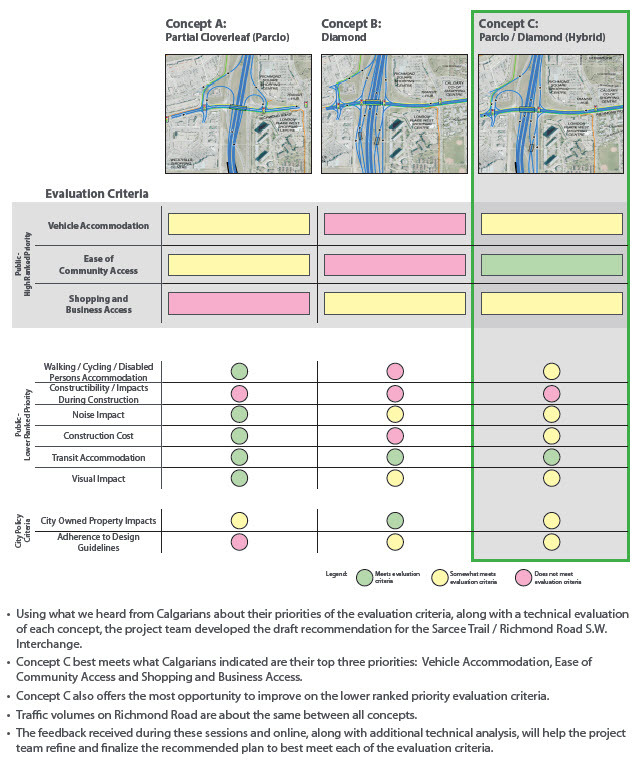 Using what we heard from Calgarians on their priorities of the evaluation criteria, along with a technical evaluation of each concept, the project team developed the draft recommended plan for the Sarcee Trail / Richmond Road S.W. Interchange. This concept best meets what Calgarians indicated are their top three priorities: Vehicle Accommodation, Ease of Community Access and Shopping and Business Access. In addition, this concept offers the greatest opportunity for improvement and refinement of key design criteria. We then used these priorities when conducting our technical review of the proposed options. Here are the results of our evaluation. 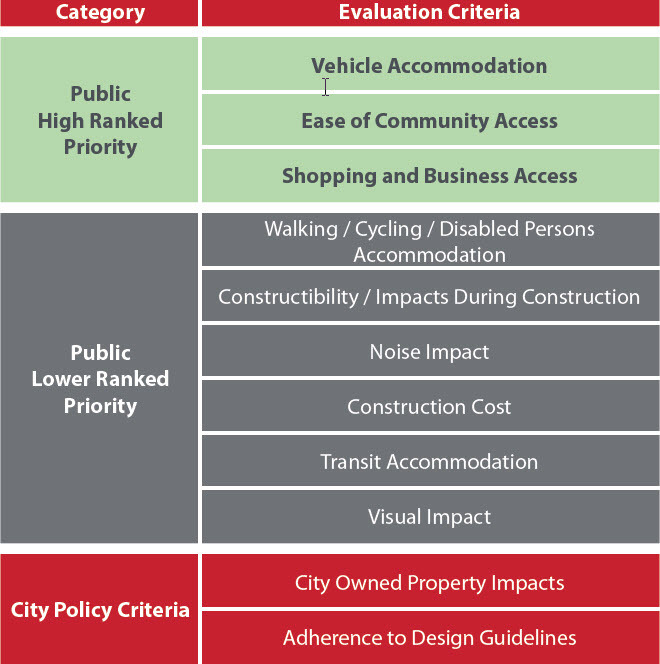 Concept C best meets what Calgarians indicated are their top three priorities: Vehicle Accommodation, Ease of Community Access and Shopping and Business Access. Concept C also offers the most opportunity to improve on the lower ranked priority evaluation criteria. Traffic volumes on Richmond Road are about the same between all concepts. The What We Heard/Did Report summarizes the public engagement program for this study and provides information on how your feedback, including issues, concerns and suggestions, was incorporated into the final project design. This is the final report back to stakeholders for this study. Learn more about what we asked and what we heard in previous phases of engagement.